written by and screenshots courtesy of Bobak! A review by Bobak!, eh? Whimsical is the best description of this game. 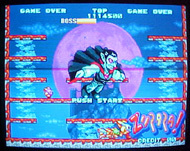 You take your "ZuPaPa" and try and clear single frame stages of all the enemies on the screen through multiple levels. That's pretty much it. Like NitD, its very similar to Snow Bros (1990). 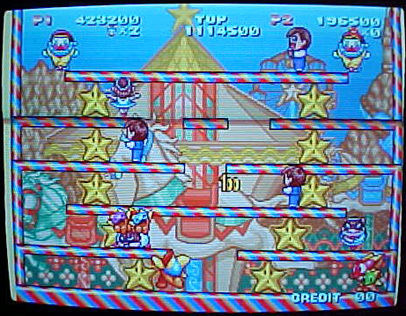 All the levels are very light and colorful, each stage adheres to a particular theme (toy land, scary monsters, the circus, etc.). The actual plot of ZuPaPa! is non-existent. Your only purpose is to clear screens and rake up points. The game really doesn't need much else. ZuPaPa! 's unique point is its choice of weaponry. In addition to your ZuPaPa's punch, you can gather and use "Zooks," which are little creatures that resemble small ZuPaPas. Once the Zooks are gathered and thrown onto an enemy, they beat it until your character touches the enemy, causing it to explode in a blast radius relative to the number of Zooks on it (up to four). This forms the basis for chain reaction points and fighting bosses. ZuPaPa! gives gamers all they could need: Bright, colorful, fun graphics that embody they theme and take nothing away from the gameplay. 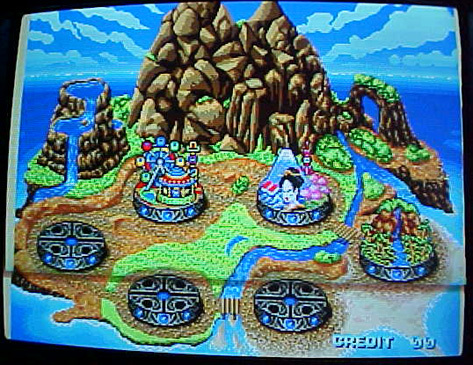 There is no slowdown, no flicker, only screen after screen of colorful creatures and backgrounds (some reminding me of such games as Captain Tomady, NitD, and Tempest). 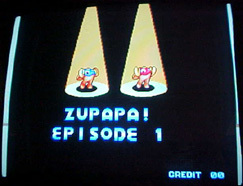 The ZuPaPa and Zooks are well animated and characterized. For example: if you abuse your Zooks by throwing them around too much, they will get upset and run away from you. Its the attention to those kinds of details that keep the game consistent. 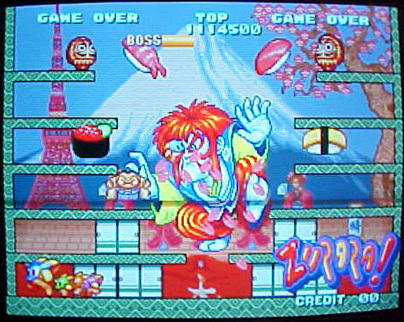 The game also seems to be geared more towards Japanese audiences, similar to the original Snow Bros. The music in ZuPaPa! is surprisingly good. There are a couple of light-techno themes that actually get you going. The sound effects are also good, giving off light hearted pops and bangs -again, very appropriate. ZuPaPa! plays very smoothly, like a refined Snow Bros. The challenge is adequate, and will give veteran gamers a good work-out. Unlike Snow Bros and NitD, ZuPaPa! allows you to jump down a platform instead of just up. This takes away the annoying problem of getting trapped by enemies because their above you. 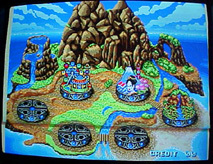 The different ways of dispatching your enemies with or without Zooks gives the game variety and skill. There are a lot of ways to increase your points in this game. 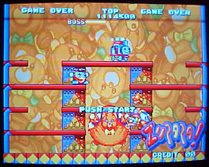 In addition to the bounty of bonus items, you get large bonuses for clearing multiple enemies with a single Zook-blast. 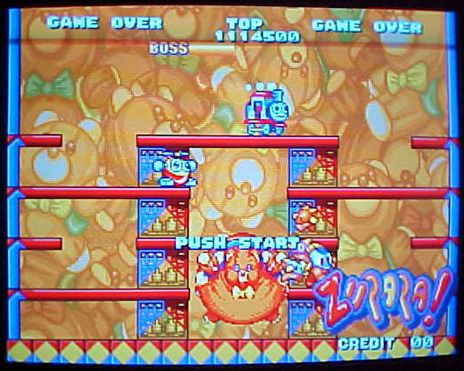 Several of the power-ups deal directly with points -giving you points for something as simple as jumping or punching! 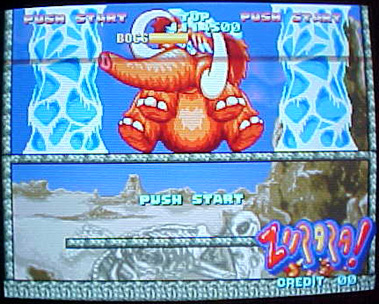 There are also performance enhancing power-ups that allow ZuPaPa to move faster or throw more Zooks at one time. All in all, ZuPaPa! 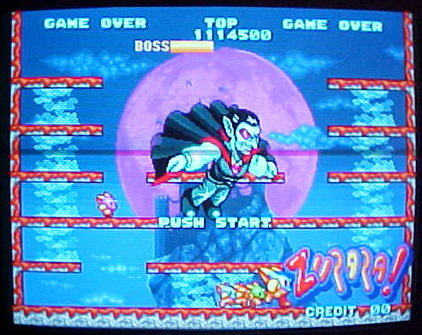 carries on the old video game tradition of playing to beat the high score. 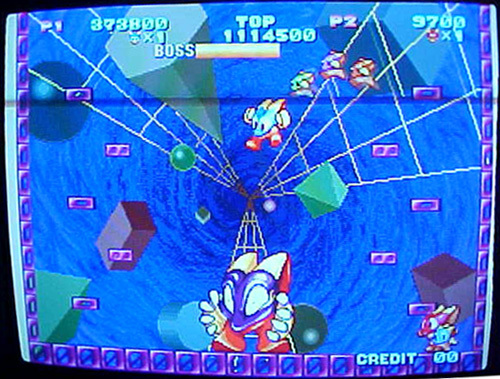 The 2-player mode adds even more replay. ZuPaPa! is a game in the traditions of the old school: Giving players simple goals, decent graphics, and excellent gameplay to reach the prize. Even though the similar NitD was released in the previous year, I see no reason not to enjoy each. Of the two, ZuPaPa! is the better game: offering more replay, more variation and appealing characters. One of the things I noticed after beating the game is that the programmers had titled it "Episode 1." Its a shame there will probably never be a sequel. I, for one, would have looked forward to it. Will we see a sequel? Don't hold your breath. Note: As an interesting final note, ZuPaPa! also holds the distinction of not showing any programmer credits in the ending. After the fictional game cast scrolls by the simply game ends. Either the staff at Face never got to adding that part before it was shelved for many years or the ZuPaPas are an actual sentient AI that programmed themselves into their own game. You be the judge. Bobak! : is actually three people: Bo (Bob Mendelson), Ba (Reggie Baker), & 'K' (who'd rather not give away his nefarious identity). These three blokes started as college buddies with a shared interest in the Blues. Unfortunately, their first and only band, "Bobak! ", failed miserably -but, the extra time failing gave them allowed them to stick to their main hobby: Video Games. Majoring respectively in Theater, International Relations, and Computer Engineering, Bo-Ba-K continue to remain friends out of college, and collaborate on writing for this website.